How does Handi-foam differ from the foam I can buy at a DIY store? Will spray foam stick to any surface? How do I remove cured polyurethane foam? Is spray insulation foam waterproof? What fire rating does the spray foam have? How thick do I need to spray the foam? How much will coverage will I get from each DIY spray foam kit? Is temperature important when applying the foam? How do I warm the spray foam tanks? Is the foam resistant to rodents/insects and other vermin? Will the foam degrade in the sun? Can the foam spray nozzles be re-used? Can the spray gun & hose assembly be re-used? The foam is known as expanding foam - how much does it expand by? What is the narrowest cavity I can inject Slow-rise foam into? What temperature range can the cured foam be used in? Does Handi-foam use an ozone friendly blowing agent? Can the foam be decorated? If I'm renovating a roof, what do I do with the roofing felt? What's the difference between Handi-foam and the foam I can buy at my local DIY store? The foam from your local DIY store (which usually comes in a single can) is called one-component foam and has an open cell structure (similar to a sponge). It relies on moisture in the air to cure and generally takes around 24 hours to cure fully. It is not designed for insulating and will absorb moisture. This type of foam cannot be sprayed and is used for sealing gaps around window frames etc. Handi-foam is a sprayable two-component foam which cures chemically when the two components are mixed. It cures quickly in 5-10 minutes and forms a closed cell structure making it an excellent insulator, which is impervious to moisture. The sprayed foam will stick to most surfaces which are dry, dust and grease/oil free. There are some surfaces which the foam will not stick to, these being Teflon, polyethylene and some other plastics. The foam does not stick to bitumen however, it will stick to bitumen paint. The only way to remove the cured foam is mechanically. Thus it is imperative to give consideration to overspray, spillage and areas where you do not want the foam to adhere to, before spraying foam. The same way that you would protect objects from paint spillage would apply to using foam i.e. protecting carpets with plastic sheeting or taping objects to prevent foam adhering to them. Yes, the foam has a closed cell structure and is therefore impervious to water. At a thickness of 3.5" (90mm) the foam has a permeability of less than 1 perm (55ng/m2.s.Pa). This means the foam becomes a vapour barrier at this thickness. This gives the foam damp proofing capabilities. The cured foam has a B2 rating under DIN 4102. In lay-mans terms this means that the foam will not cause the spread of flame and is self extinguishing if the flame source is removed. This depends on the application. For example, when insulating narrowboats 1" (25mm) is normal to achieve adequate insulation. For insulating and draught sealing this would be adequate. 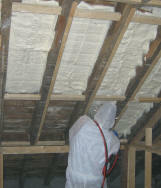 For loft insulation or attic insulation, the thickness will depend on the building's design, materials of construction. To prevent condensation on internal surfaces of buildings, it may be necessary to spray the foam to a thickness of 3" (75mm) but in practice, less is usually sufficient. With new-builds it is best to check with the local planning department as they may specify a thickness. The temperature of the foam cylinders is critical to ensure correct mixing of the components. The foam cylinders must be above 24 degrees C when used. We include free strip thermometers so you can be sure of the temperature of the foam tanks, before you spray. The temperature of the surface being sprayed is generally not an issue (provided it is above 4 degrees C) but may affect the curing time and cause minor skrinkage. Please consult us if you have any queries regarding surface or mould temperatures. The foam is inedible and has no nutritional value. 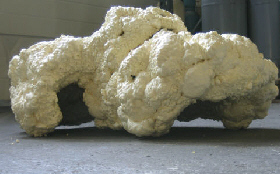 UV light will cause the cured foam to darken and degrade unless it is painted. Nozzles can be re-used provided they are cleaned with acetone immediately after use. If the foam is allowed to set in the nozzle first, then it will be impossible to clean the nozzle. This is important to remember as the foam sets very quickly (30-60 seconds for the Quick-Cure). Yes, if re-used within 10 days. The A-component will harden if exposed to moisture in the air, so it is best to leave the hoses attached to the tanks (with a used nozzle on the gun) between jobs. The foam is known as expanding or expanded foam - how much does the sprayed foam expand by? The foam is called expanding foam because it contains a blowing agent which introduces bubbles or cells into the foam as it cures. This makes the foam less dense and greatly improves it's insulation properties. Expansion takes place in 2 places, both in the nozzle and after it leaves the nozzle. It expands by a ratio of approximately 8:1 after it leaves the nozzle. No, the cured foam is not toxic. The separate (unreacted) foam components may cause irritation with some people, thus it is best to wear gloves, glasses and a chemical dust mask when handling or spraying foam. With cavity walls, the limit is approximately 2". Below this depth the foam may not flow adequately in the cavity and may leave gaps. For mould filling applications, please contact us for advice. 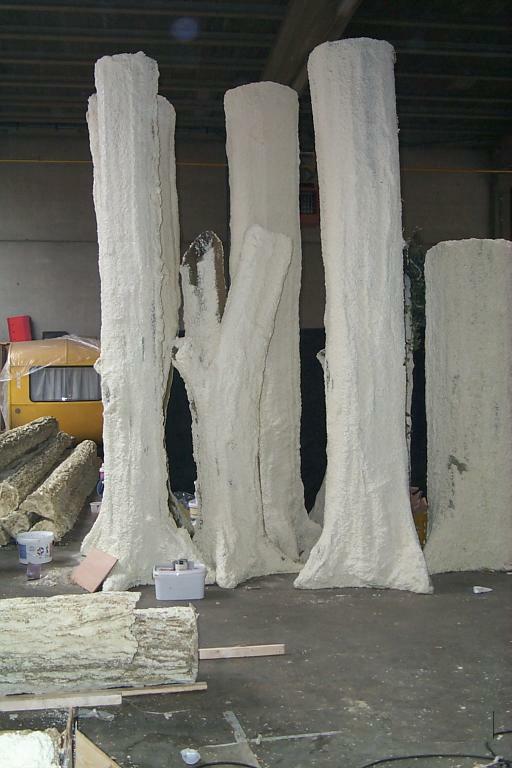 The cured foam can be sanded, plastered, painted, cut back, sculptured etc. The choices are endless! The foam can be sprayed directly onto the felt. Any tears or small holes will be effectively covered and sealed. If the felt is in a really poor state, it may be advisable to cut any loose hanging bits of felt away.